If you are trying your best to leave less and less of a carbon footprint as well as trying to save money, but need to organize your things, then check out this super cool craft idea for your makeup. This video shows you just how simple this idea is and it looks cute too! It will organize all your smaller makeup items so that you can see them. My family has invested in reusable water bottles to come away from using the disposable ones. Even though they get recycled it still takes energy. But even if you can keep a few of them out of the landfill or the recycling depot, you not only help the cause but you can create some super cool organizing ideas on the cheap! I love that they sit on their side so that the containers don't collect dust etc. You could make this pyramid as wide or as tall as you want. You could even like a wall with them! If you don't have any plastic water bottles, then head to the reuse center, there are always loads of them. Unfortunately around my area, they are thrown from cars and into ditches and streams, so collect, them, give them a good rinse and get crafting! Below is another cute video showing you just how upcycling plastic bottles can be fun and useful! In the above video, she paints the plastic, but I think it would look good clear myself, but I love how she incorporates the lids into the middle support. There are many ways to get organized. I find online to be a great place to start if you are not into DIY. Everyone has different needs when it comes to organizing. You want something that is easy to use and still looks good. Check out the rest of my site for some awesome ideas especially when it comes to bathroom organization. If you rent, then you need to get creative with organizers that can move when you do, such as pedestal cabinets that will fit under a pedestal sink and are portable and on wheels that can go with you without any DIY. There are shower curtains with pockets for storage. There are so many cool ways to get organized even in a small bathroom, kitchen, bedroom or anywhere. ​You can shop online for variety and good prices, or you can do some creative DIY as above! But you will feel better once you clear away clutter and organize the things you want to keep. 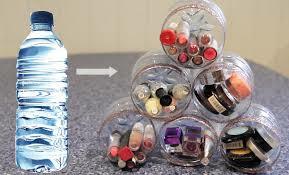 Below is another DIY craft for tiny things using the plastic bottle caps. Would be cool for earrings, beads or tiny bits of hardware. So, yes, even the lids can be recycled! I have found many cute ways to get organized, and I thought I would share this page to get you inspired to try a bit of DIY for organizers on the cheap!